1st Edition, 2011, XVIII, 445 p. 262 illustrations, 89 in color. This volume combines review and solicited contributions, related to scientific studies of Division I of IAGA presented at its Scientific Assembly in Sopron in 2009. 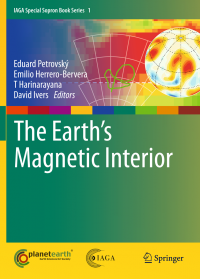 The book is aimed at intermediate to advanced readers dealing with the Earth's magnetic field generation, its historical records in rocks and geological formations - including links to geodynamics and magnetic dating, with magnetic carriers in earth materials, electromagnetic induction and conductivity studies of the Earth interior with environmental applications of rock magnetism and electromagnetism. The aim of the book is to provide an overview of recent advances and future challenges in these particular fields of research. 1st Edition, 2011, XXI, 480 p. 150 illustrations, 70 in color. 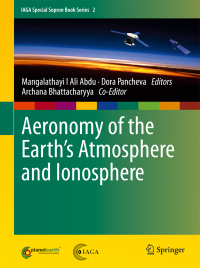 This book is a multi-author treatise on the most outstanding research problems in the field of the aeronomy of the Earth's atmosphere and ionosphere, encompassing the science covered by the Division II of the International Association of Geomagnetism and Aeronomy (IAGA). It contains several review articles and detailed papers by leading scientists in the field. The book is organized in 5 parts: 1) Mesosphere-Lower Thermosphere Dynamics and Chemistry; 2) Vertical Coupling by Upward Propagating Waves; 3) Ionospheric Electrodynamics and Structuring; 4) Thermosphere- Ionosphere Coupling, Dynamics and Trends and 5) Ionosphere-Thermosphere Disturbances and Modeling. The book consolidates the progress acheived in the field in recent years and it serves as a useful reference for graduate students as well as experienced researchers. 1st Edition, 2011, XIV, 368 p. 178 illustrations, 100 in color. Despite the plethora of monographs published in recent years, few cover recent progress in magnetospheric physics in broad areas of research. While a topical focus is important to in-depth views at a problem, a broad overview of our field is also needed. The volume answers to the latter need. 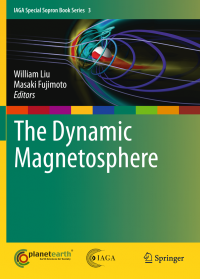 With the collection of articles written by leading scientists, the contributions contained in the book describe latest research results in solar wind-magnetosphere interaction, magnetospheric substorms, magnetosphere-ionosphere coupling, transport phenomena in the plasma sheet, wave and particle dynamics in the ring current and radiation belts, and extra-terrestrial magnetospheric systems. In addition to its breadth and timeliness, the book highlights innovative methods and techniques to study the geospace. 1st Edition, 2011, XVI, 383 p. 210 illustrations, 85 in color. This volume represents the state of the art of the science covered by the International Association of Geomagnetism and Aeronomy (IAGA) Division IV: Solar Wind and Interplanetary Field. It contains a collection of contributions by top experts addressing and reviewing a variety of topics included under the umbrella of the division. It covers subjects that extend from the interior of the Sun to the heliopause, and from the study of physical processes in the Sun and the solar wind plasma to space weather forecasts. 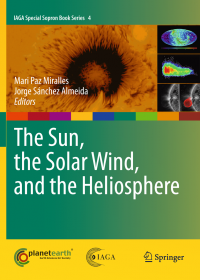 The book is organized in 6 parts: the solar interior, the solar atmosphere, the heliosphere, heliophysical processes, radio emissions, and coordinated science in the Sun-Earth system. In addition, we highlight some of the results presented during the IAGA Division IV symposia in the 11th Scientific Assembly of IAGA in Sopron, Hungary, on 23-30 August 2009, which was planned simultaneously with this book. Audience: This book is of interest for researchers and graduate students interested in solar physics and related fields such as astrophysics, space plasma physics, and laboratory plasma physics. 1st Edition, 2011, XV, 343 p. 130 illustrations, 10 in color. 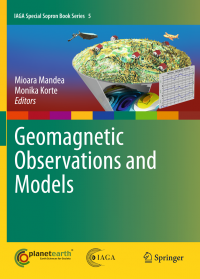 This volume provides comprehensive and authoritative coverage of all the main areas linked to geomagnetic field observation, from instrumentation to methodology, on ground or near-Earth. Efforts are also focused on a 21st century e-Science approach to open access to all geomagnetic data, but also to the data preservation, data discovery, data rescue, and capacity building. Finally, modeling magnetic fields with different internal origins, with their variation in space and time, is an attempt to draw together into one place the traditional work in producing models as IGRF or describing the magnetic anomalies.